Our Outreach Department is active in community education. We are proud of offer our expertise in public safety. Promoting a healthier, safer community. 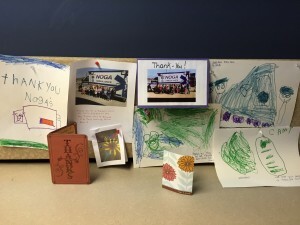 Kids draw the best thank you cards! Children are the future of our community. As a family owned business, we understand the importance of child safety. Our Ambulance Demo Program offers children an opportunity to visit our ambulance. Children learn about emergency equipment and how EMS takes care of patients. Our education specialist teach the importance of bike helmets, car seats, playing safely, and the Mr. Yuck program. Children learn the importance of protective sports equipment. They are education on the proper fit and use of sporting equipment. Classes held by certified car seat technicians. We educate parents and caregivers in the proper selection, installation, and securement of children. Classes ensure caregivers are knowledgeable on child vehicle safety from infant to young adult. As first responders, we see first hand, the devastation drugs and alcohol have on our community. We work with Lawrence County Drug & Alcohol on prevention programs for young adults. 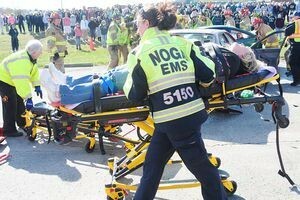 Taking part in mock accidents at our local high schools educating on the dangers of driving under the influence. For more information how we can meet your educational needs please contact our Outreach Department.